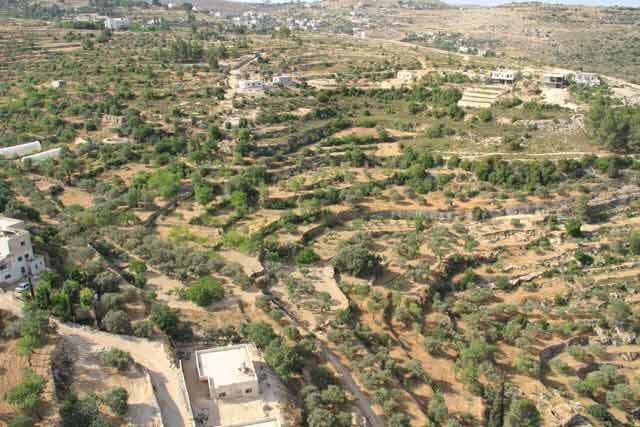 During October 2010, an archaeological survey was conducted in the ‘Ain Joweizeh spring located on the outskirts of the Walajeh village, south of Jerusalem (Permit Nos. A-5918, A-6087; map ref. 214952–5050/627432–504). The survey, on behalf of the Israel Antiquities Authority, was performed by D. Ein Mor, with the assistance of Y. Shmidov and A. Hajian (surveying and drafting), A. Yehezkiel and A. Frumkin (the Cave Research Unit), D. Amit (academic supervisor, the IAA Jerusalem Region) and Y. Baruch (Jerusalem region archaeologist). ‘Ain Joweizeh (map ref. 214952/627432) is the longest tunnel spring in the country (overall length 215–220 m). The rock-hewn tunnel twists through hard dolomite bedrock of the Aminadav formation, conforming to the channel of a ravine that drains from the southwest to the northeast, toward Nahal Refa’im (Fig. 1). The ravine’s streambed was dammed by ancient farming terraces, which are planted today with groves of almond and olive trees that are cared for by the residents of the village (Fig. 2). ‘Ain Joweizeh, ‘the Spring of the Little Walnut’ in Arabic, appears by that name on the Survey of Western Palestine map from the late nineteenth century CE (Conder and Warren 1880: Sheet XVII, ‘Áin el-Joweizeh). 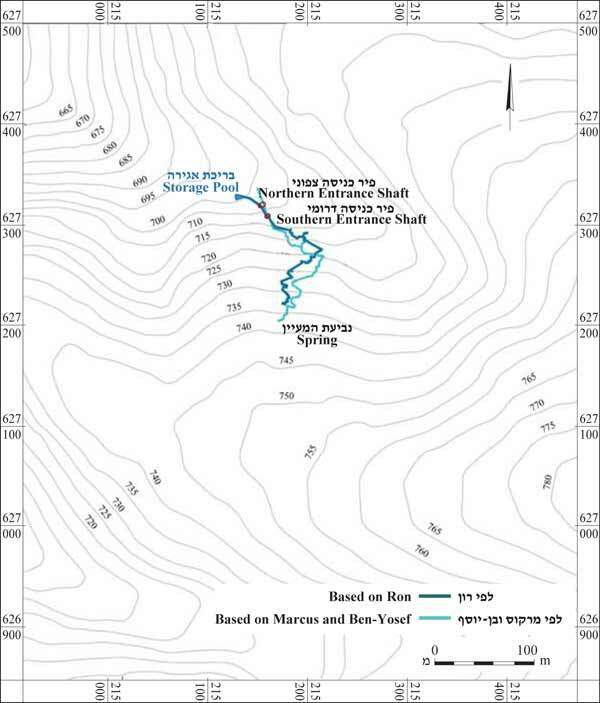 In a survey that was performed in 1982 (Marcus and Ben-Yosef 1984), the surveyors expounded upon the unique characteristics of the spring and it being the longest and most impressive of the springs located in the hills of Jerusalem and Samaria. The rock hewn tunnel (length 160–165 m) drains several springs alongside it and is denoted by straight sides and a leveled ceiling (width 0.5–1.0 m and average height 1.8 m). The water system is accessed today by way of two adjacent shafts (northern and southern) that were set in the ceiling of a covered channel section (55–60 m) that was built further on in the tunnel. 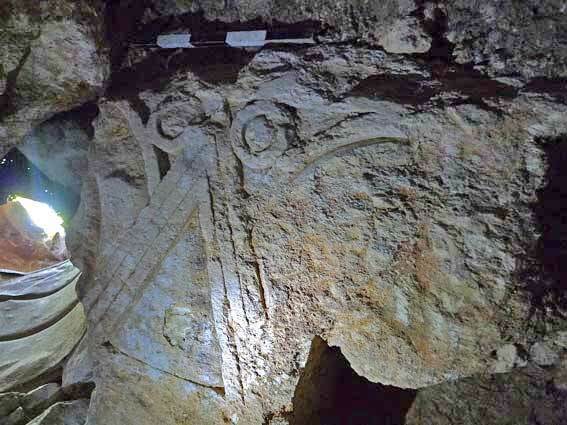 The surveyors noted that a ‘stone lintel carved by an artisan’ (Marcus and Ben-Yosef 1984: X) was located in the vicinity of the southern shaft and included a picture of it from which it is very difficult to discern details of the decoration. In 1985 a more accurate survey plan and cross-sections of the spring were published in an article that deals with the development and management of irrigation systems in the mountain region (Ron 1985). The current survey was part of the excavation project undertaken along the separation fence south of Jerusalem. During the course of the project, the entire length of the water system was inspected in an attempt to examine phases and characteristics of its construction and quarrying; the storage pool and the covered channel that connects the pool to the hewn section of the spring were measured; another access shaft (the northern one) that was not mentioned in the previous surveys was identified, and a distinction was made between the system’s construction and use phases. In the course of the survey, the same hard limestone ‘stone lintel’ mentioned in the Marcus and Ben-Yosef report (supra), was found at the base of the southern shaft. The stone was identified as an architectural element of unusual dimensions that is carved as a capital in the Proto-Aeolic style. This element served as half of the monumental opening in the water system’s façade. This preliminary report provides a brief description of the architectural element, as well as other components of this unique water system, which contribute to its dating and understanding. The element was partially buried at the base of the modern southern shaft (depth 3.6 m), dug into soil fill in a farming terrace layer. Its eastern side remained buried in the fill whereas its western side was only partially exposed; therefore, it full outline is not completely clear. Nonetheless, this seems to be a monumental element shaped like the Greek letter gamma (Γ). 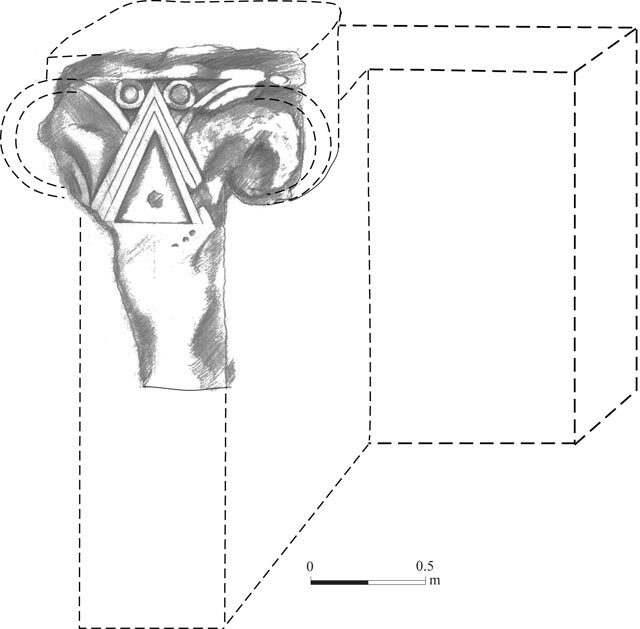 A decoration of a Proto-Aeolic capital with an excellent finish (Figs. 3, 4) is hewn on the upper part of the long front side (length 0.7 m, width 0.33–1.09 m, exposed height 1.36 m). Opposite, on the other side of the shaft, another element that was probably used in the other half of the opening was lying. Several shallow hewn depressions are visible on it, but this element is mostly buried beneath fill and its outline cannot be determined. Differences were noted in the construction features of the covered channel segment. The section between the storage pool and the southern access shaft (length c. 25 m) is distinguished by haphazardly built walls of small fieldstones that were covered with large stone slabs. Two construction phases are evident in the segment of the covered channel located south of the southern shaft. In the later phase, the channel was made narrower by the construction of ashlars in secondary use. In the early phase, the construction is characterized by excellent quality building that utilizes large well-dressed ashlars (length up to 3 m). This section of the channel terminates at a retaining wall built of ashlars in secondary use. It seems that the wall was meant to support the tunnel’s ceiling after a collapse. A hewn room with a vaulted ceiling was discerned on the southern side of the wall. The rock-hewn section of the tunnel begins east of this room. Twenty-four stone capitals decorated with a Proto-Aeolic design from the First Temple period are known from the main cities of the Kingdom of Israel: Samaria, Megiddo, Hazor and Dan. Eleven others are known from the Kingdom of Judea; ten capitals were found at Ramat Rahel where remains of a palace from the late eighth–early seventh centuries BCE were excavated, and one capital comes from the City of David excavations in Jerusalem (Lipschits 2009). Five capitals are known from the site of el-Mudeibi‘ – Mudaybi in Moab, and a capital was found in secondary use in the village of ‘Ain-Sara, west of Kerak, next to a spring of the same name. Two fragments of capitals are also known from the citadel in Amman (Lipschits 2009). The capitals from the Kingdom of Israel mainly date to the ninth century BCE and those from Judea and Jordan to the late eighth or early seventh centuries BCE. Although the central motif is identical, the capitals from the various sites differ in some features. It is nowadays presumed that these capitals adorned gates and passages of public/government buildings (palaces). However, it should be mentioned that most of the capitals were not found in situ and hence, the question concerning their use arises (Shiloh 1979). The element from ‘Ain Joweizeh is decorated with an equilateral triangle whose sides were carved in three parallel lines (length of inner triangle base 0.31 m, length of each side 0.39 m; length of outer frame base 0.56 m, length of each side 0.64–0.65 m). The triangle is set in an abacus (thickness 0.13 m), whose eastern half is broken. Concentric circles (oculus—diam. of outer circle 11 cm, diam. of inner circle 7 cm) adorn both sides of the triangle’s vertex and volutes flank its sides. Much of the eastern volute is missing. The outline of the western one is mostly preserved, although the surface of the stone and decoration are worn. An upper leaf was discerned between the western volute and the abacus and there might also be a lower leaf, although the condition of the element precludes ascertaining it. From an artistic standpoint the decorative characteristics of the architectural element from ‘Ain Joweizeh resemble the capitals found at Ramat Rahel, the City of David and el-Mudeibi‘ in Moab; however, its greatest similarity is to the capital discovered by Kenyon in the City of David excavations (Kenyon 1963). The large size and great weight of the element and its being in the ‘seam’ between the late and early segments of the covered channel indicate that its current location is very close to the original one. On the basis of its decorative features and their comparisons from the nearby region, the element can be dated to the Iron Age in general, and the late eighth–early seventh centuries BCE in particular. The impressive wall segments surveyed in the section of the covered channel south of the southern shaft, the rock-hewn room and especially, the section of the rock-cut tunnel, reflect an enormous investment that allows attributing this system to a public project of national initiative. The hydrological knowledge and quarrying technology used in this project are known from various water systems throughout the country, which were dated to the Iron Age; the nearest one, both geographically and chronologically, is Hezekiah’s Tunnel in Jerusalem whose quarrying had been dated to the end of the eighth century BCE. ‘Ain Joweizeh spring is located c. 8 km from the City of David and c. 6.5 km from Ramat Rahel. A tunnel spring indicates the presence of a nearby settlement, yet the connection between the water works and its surroundings is still unclear. Many of the farming terraces in the vicinity of the spring are built of ashlars in secondary use. The soil used to fill the terraces has a grayish tinge reminiscent of “tell soil” and an especially large amount of potsherds from a variety of periods (Middle Bronze II, Iron Age, Roman and Byzantine) is scattered along the surface. There might have been an estate or royal palace similar to Ramat Rahel here during the eighth–seventh centuries BCE; another possibility is a settlement from this period that is mostly buried beneath the farming terraces covering the ravine. In any event, the site existing here benefited from the region’s abundant sources of water, its proximity to the road that ran through Nahal Refa’im and the ability to cultivate the agricultural areas in a broad section of the stream. The presence of a public/national(?) water system in the region from the time of the Kingdom of Judea has ramifications on our understanding of the agricultural hinterland surrounding Jerusalem, and the degree of administartive influence the city had over this region. This water system can contribute to the study of the technological and chronological aspects of the tunnel spring phenomenon that is characteristic of the mountain region. In the meantime, this is the only such spring that definitely dates to the Iron Age, although the possibility that this water system had an earlier phase cannot be ruled out. Conder C.R. and Warren C. 1880. Survey of Western Palestine – Maps of Western Palestine, in 26 Sheets, from Surveys Conducted for the Committee of the Palestine Exploration Fund, London. Kenyon K.M. 1963. Excavations in Jerusalem, 1962. PEQ 95:7–21. Lipschits O. 2009. The Origin and Date of the Volutes Capitals from Judah, Moab and Ammon. Cathedra 131:6–24 (Hebrew). Marcus M. and Ben-Yosef S. 1984. 'Ain Joweizeh – the Longest Tunnel Spring in the Judean Hills. Niqrot Zurim 8:6–54 (Hebrew). Ron Z.Y.D. 1985. Development and Management of Irrigation Systems in Mountain Regions in the Holy Land. Transactions of the Institute of British Geographers, New Series, Vol. 10, No. 2, pp.149–169. Shiloh Y. 1979. The Proto-Aeolic Capital and Israelite Ashlar Masonary (Qedem 11). Jerusalem. 1. Location map and plan of the spring based on Marcus and Ben-Yosef and Ron. 2. The ravine in which the water system was hewn, looking west. 3. Reconstruction of the element. 4. The element and the shaft to its left, looking south.